A group, under the umbrella of Coalition of Concerned Citizens for Better Healthcare in Kaduna State, has scored the State Governor, Nasir El Rufai, low on health development indices in the state from 2015 to 2018. 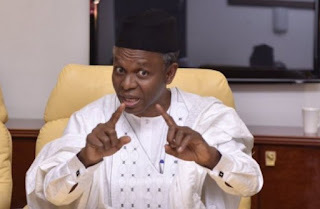 However, the Kaduna State Government said it has concluded arrangements to recruit 3,059 health workers to meet minimum service delivery gaps in its 255 primary health centres. The Commissioner for Health and Human Services, Dr Paul Dogo, made the disclosure in Kaduna, yesterday, while addressing newsmen on activities of the ministry between January and September, 2018. He said the staff, when fully engaged, would support the effort of the state government to strengthen the state Primary Health Care Development Agency. Dogo also said the State Executive Council had approved the agency’s corporate plan aimed at restructuring the health sector for efficient service delivery. According to him, the major health policy thrust of the government is the revitalisation of the 255 primary health centers, to meet minimum standards. “We’ve made tremendous progress in the implementation of primary health care under one roof and the designation of one model primary health care centre per political ward. “We’ve employed 23 medical personnel who have been deployed to all the local government areas, to equally ensure efficient service delivery to the people,” the commissioner said. He said the government has also improved quality of immunisation services from 41 percent in the fourth quarter of 2017, 41 percent in the second quarter of 2018 to 61 percent in the third quarter of 2018. But the leader of the Concerned Citizens, Mr. Timothy Sajoh, while addressing a press conference, expressed dissatisfaction with the poor quality of healthcare delivery in the State. He noted that a survey conducted by the National Nutrition and Health Survey (NNHS) revealed that Kaduna State performed abysmally across the Save One Million Lives (SOML) Performance for Results (P4R), using six high impact MNCH interventions as indicators to measure the performance of states in Nigeria. VIEW 120+ COMMENTS AFTER DROPPING YOURS, WHAT'S YOUR OPINION? Mp3 Download: Tuzz releases Hot new single titled "Mic Check"
mp3 Download: Port Harcourt city Star Dandizzy releases new track titled "Garni"
Picture: The first storey building in Nigeria. reserved. All market data delayed 20 minutes.